The Nongovernmental International Panel on Climate Change (NIPCC) will release a major new report on climate-change science produced by an international team of 40 scientists at a press conference on September 17 at the James R. Thompson Center in downtown Chicago. When: 10:00 a.m., Tuesday, September 17. Save the Date: On Monday, September 23, Noon, Lead author Bob Carter and Co-author Willie Soon will be discussing the new NIPCC report at the Heritage Foundation on Capitol Hill, Washington. Details to follow. Lead authors Fred Singer and Bob Carter will be making presentations in Europe and in California. Details to follow. The Hot Spot: The supporters of the UN International Panel on Climate Changes (IPCC) have played elaborate statistical games in their efforts to explain away the fact that satellite and weather-balloon observations have failed to identify the Hot Spot. This is the volume of the atmosphere centered over the tropics at about 10 km (33,000 feet) where a surface warming trend, whatever the cause, should cause a more pronounced atmospheric warming trend. Note that warming trends in the two locations are the issue, not temperatures. IPCC supporters have mistakenly claimed the Hot Spot is the distinct human fingerprint. SEPP Chairman Fred Singer presents an unusual explanation why the Hot Spot has not been detected by the most comprehensive measurements of the earth’s temperatures, the satellite observations. No doubt, it will be controversial. Please see Article # 1. Australia’s Hot Spot: On September 7, Australia held parliamentary elections. The party in power, the Labor Party, was thoroughly defeated. The poor economy was one issue, another major issue was the carbon tax. After the carbon tax was implemented, the Carbon Sense Coalition and the No Carbon Tax Climate Skeptics Party were formed. These groups exposed to the public the preposterous climate claims being made by government agencies in the government’s efforts to justify the carbon tax. TWTW reader Stefan Björklund analyzed the energy program of the victorious Liberal-National coalition, commenting how different it is from Germany’s energy plan. The Liberal-National coalition energy program features scrapping the CO2 tax, no emissions trading, support for increased use of domestic oil, natural gas and coal, thorium development for nuclear energy (thanks to David Archibald), and tougher environment standards for wind power with real time monitoring of noise and health effects. Now if only the victorious party can avoid implementing foolish programs “to fight” largely naturally occurring global warming/climate change. Please see links under Questioning Green Elsewhere and Cap and Trade and Carbon Taxes. Germany’s Hot Spot: A German federal election will be held on September 22 to determine the members of the Bundestag, the main federal legislative house. Almost unthinkable a year ago, members of the mainstream press, such as Der Spiegel, are severely criticizing the government’s green energy program with articles such as: “Germany’s Energy Poverty: How Electricity Became a Luxury Good.” If the election is unfavorable to the government, perhaps some politicians will begin to notice that the public does not like being punished by higher energy costs stemming from politically egotistical efforts “to fight” global warming/climate change. Please see links under Questioning European Green. Another Piece to the Puzzle: The CERN experiment demonstrated that high-energy cosmic rays can promote the formation of small clusters of molecules. This was another step in testing the cosmic-ray/cloud hypothesis advocated by Danish physicists, including Henrik Svensmark. The hypothesis is that high-energy cosmic rays influence the cloudiness on earth, but are modulated by the sun. When the sun is not active, the magnetic shield is reduced, and more high-energy rays hit the upper atmosphere resulting in more clouds. When the sun is active, fewer high energy cosmic rays hit the upper atmosphere resulting in less clouds. A small change in cloudiness can have a significant influence on surface temperatures. After the CERN experiment, the hypothesis ran into a snag. The numerical simulations of the prevailing chemical theory demonstrated that the small particles will not grow to sufficient size to create clouds. 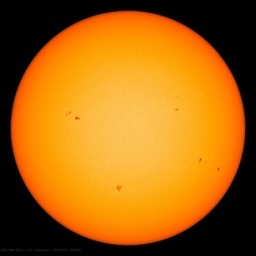 The assumption is that once the sun goes down in a particular area, the particles stop growing. The researchers at the Technical University of Denmark tested the theory in a series of experiments. In one set of experiments the particles stopped growing. In another set of experiments, they found that under exposure to natural cosmic rays and gamma-rays the small particles continue to grow after the daylight is removed. No doubt, there is much additional work needed and the Climate Establishment will find other objections. But the persistence of the Danish researcher to continue to test a politically unpopular scientific hypothesis is laudatory. If it proves to be correct, the claim that carbon dioxide emissions are the principal cause of global warming/climate change is wrong. Please see links under Science: Is the Sun Rising? Hypothesis Testing: Last week’s TWTW discussed hypothesis testing as presented by the noted physicist Richard Feynman. The tested hypothesis is a positive assertion of a relationship between two or more phenomena. The null hypothesis is that there is no relationship, which is the default position. If the hypothesis fails direct testing, the default is tentatively accepted until another hypothesis survives testing. Professor Emeritus Elliot Cramer of the Department of Psychology, University of North Carolina objected, stating this is wrong. You can only reject the null hypothesis, you can never accept it. By so doing, Professor Cramer brings up another form of hypothesis testing, an indirect form. The null hypothesis is tested to a certain level of confidence. If it fails, the positive assertion is tentatively accepted. Without getting into the statistical techniques, each form has its advocates. The direct testing form is generally accepted in physical sciences. The indirect testing form is accepted in many social sciences and in many medical studies. As such, it has resulted in many false positives, which cannot be replicated. If climate science is a physical science, then the generally accepted methods for physical sciences should be followed unless there is compelling evidence that they are unsatisfactory, which should be stated. In any event, the practice of testing models against the same data that was used to develop the models is unsatisfactory. Please see last week’s TWTW and the repeated links under Problems in the Orthodoxy. Scientific Method: Following a long exchange among scientists on the scientific method, SEPP Director, Tom Sheahen neatly summed up the discussion. The conclusions are noteworthy. A) A cornerstone of the scientific method, probably 500 years old, can be expressed as “data trumps theory.” In the 20th century, Feynman said it elegantly a dozen times. C) When the computer models don’t agree with the observations, don’t complain about the data, but instead go back and revise the models. D) Don’t begin trying to plan national policy until you’ve got the science right, as evidenced by agreement between theory and data. Otherwise it’s just futile and expensive. What is obviously logically flawed is to assert point B and then ask for blind trust in computer models, ignoring the need to observe point C.
Social Benefits of Carbon: A study asserted that soot emitted by the use of coal with the industrialization of Europe stopped the Little Ice Age, at least in Europe where glacial expansion threatening villages stopped. Luboš Motl comments that the paper talks about forcings between 9 and 35 watts per square meters. “This is vastly higher than the ‘dangerous’ forcing often attributed to the doubling of CO2, 3.7 watts per square meter.” If the paper is correct, we all should be thankful. Please see links under Social Benefits of Carbon. 97% Consensus: On his Bishop Hill blog, Andrew Montford announces his paper on the famed 97% of scientists … produced by John Cook, et al. and claimed by President Obama. Montford finds that: An analysis of the methodology used by Cook et al. shows that the consensus referred to is trivial: 1) carbon dioxide (CO2) is a greenhouse gas; and 2) human activities have warmed the planet to some unspecified extent. Please see link Challenging the Orthodoxy. Testimony: Roger Pielke, Jr. downloaded the 1974 Senate testimony of Paul Ehrlich and John Holdren on the Limits to Growth and their Malthusian philosophy. Pielke intends to use it for a future course about the role of experts in policy making. Ehrlich is now a Fellow of the Royal Society and Holdren is the science adviser to President Obama. A quote from each is in order. Ehrlich “I suspect you’re aware, that the increased price of petroleum which is certainly related to the near depletion of petroleum resources-they’re going to be gone by the end of the century . . .” Holdren: “The main point here is that, although there may be defects in any specific detailed model, the general conclusion is far more robust than any specific model.” Please see link under Lowering Standards. Number of the Week: 2.1 Million. This is the number of direct and indirect jobs in the US created by the oil and gas revolution by the end of 2012, as estimated by HIS CERA Consulting. As with all such estimates, there are details that can be criticized. However, the Energy Information Administration estimates that from 2007 to 2012 jobs in the oil and gas industry increased by 40%, while jobs in the entire private sector increased by 1%. Unlike the fabled green jobs that politicians are touting, no government subsidies, mandates, or specific tax breaks were required to create these jobs. They are sustainable as long as the oil and gas industry thrives. They were created on private and state owned lands. In 2012, the production of oil, natural gas, natural gas liquids and coal all fell on federally controlled lands. Please see links under Energy Issues – US. Quote of the Week: Please see Andrew Montford’s application of this this famous quote under Communicating Better to the Public – Make Things Up. 2. It Was a Dark and Stormy Climate Study . . .
Would that all forward-looking global-warming research got such a skeptical reception. The Energy Department hopes to revive an Obama clunker. The Hiatus in Global Temperature Explained? Industrial revolution kicked off Alpine glacier retreat fifty years before warming began. Black Carbon Soot shrank the 19th century glaciers – but why isn’t it listed as a culprit today? Can The IPCC Do Revolutionary Science? Now Dead And Extinct…Climate Issue Not Even Mentioned Once In Germany’s Televised National Election Debate! Germany should not dismiss gas fracking technology that has boosted US industry, nor unilaterally overexpose itself to climate protection efforts, European Energy Commissioner Günther Oettinger said on Tuesday (3 September). Oettinger said German industry could afford to pay 50% or 100% more for energy than rivals in the United States, “but not more than that”. Tamu Massif rivals the size of Olympus Mons on Mars. Reference: Cai, W. and Cowan, T. 2013. Why is the amplitude of the Indian Ocean Dipole overly large in CMIP3 and CMIP5 climate models? Geophysical Research Letters 40: 1200-1205. Reference: Bignami, S., Sponaugle, S. and Cowen, R.K. 2013. Response to ocean acidification in larvae of a large tropical marine fish, Rachycentron canadum. Global Change Biology 19: 996-1006. Reference: Gabay, Y., Benayahu, Y. and Fine, M. 2013. Does elevated pCO2 affect reef octocorals? Ecology and Evolution 3: 465-473. Reference: Leu, E., Daase, M., Schulz, K.G., Stuhr, A. and Riebesell, U. 2013. Effect of ocean acidification on the fatty acid composition of a natural plankton community. Biogeosciences 10: 1143-1153. Reference: Heuze, C., Heywood, K.J., Stevens, D.P. and Ridley, J.K. 2013. Southern Ocean bottom water characteristics in CMIP5 models. Geophysical Research Letters 40: 1409-1414. Will Obama Approve Keystone? Does It Matter Anymore? Lobbying trumped science as politicians lavished more than $100-billion in subsidies on morally suspect energy. Globally, in 2011 Canada, the US, EU, China, India, Brazil and Australia spent more than $40 billion on biofuel subsidies. Since 2005 more than $100 billion has been allocated to biofuel programs. O Legacy, Where’s My Legacy? The Canadian Coast Guard rescued a group of Americans who attempted to travel through the Northwest Passage on jet skis as part of a reality television show. Ehrlich is the gift that keeps on giving. Watch for fireworks on this one folks. No one knows the depth of corruption in the “judicial” system. This became clear when the Obama Administration “flipped” SCOTUS Chief Justice John Roberts on the Obamacare legislation..
Just about every legal pundit assumed that Roberts’ vote would be against Obamacare because it was so plainly unConstitutional. Roberts’ questions during oral arguments were highly skeptical of the law. The media discussion revolved around the question of whether Kennedy, or another Associate Justice would be the swing vote. But everyone assumed that Roberts would vote against Obamacare. But in the final 24 hours, Roberts flipped, changing his ruling on Obamacare at the last minute and basing that ruling on an argument that the government didn’t even argue in court! He voted to uphold the law on plainly ridiculous grounds. Therefore, the inescapable conclusion is that either Obama operatives found something in Roberts’ past [like they did with General Petraeus], or they found something that Roberts wanted more than he wanted to defend the Constitution. Any student of human nature can see what happened. That means that now the highest justice in the nation’s highest Court has been corrupted. Also, the very public humiliation of Gen Petraeus has cowed the military general staff. Now that the courts and the military have been corrupted, who will defend American citizens? Answer: no one. The country is lost. The great experiment is over. King Obama has won. I would point out as well that Roberts swore in Obama 4 times: Once in public at each inaugural, but twice OUTSIDE that public ceremony. The first was claimed to be needed for some “mistake” made on the public oath, so it had to be repeated. but no one admits to what that original “mistake” was, nor will anyone admit to what the “private oath” actually was. The third ceremony occurred on Sunday, Jan 20 (when the fed government was “closed”) so the public ceremony could be done on Martin King day a few days later. Again, no one admits to what the private ceremony actually swore, nor to what it was swearing, or upon what documents it was sworn. Though, then again, he did swear to defend the nation against all enemies, foreign and domestic. Its just that, to Obama and his media, “all enemies” means all who oppose Obama’s policies, all who are not democrats, and all who do not fund democrat campaigns. There are three things I’ve been noticing lately that should be more prominent in the debunking of Catastrophic Man Made Global Warming. Actually, it is already trending that way. 2. The missing warming of the last 20 years. 3. That man-made CO2 has a half life of 5 years while the increase we see at Mauna Loa indicates an average half life of CO2 of 30 years or more. The first two are obviously linked in the round up. But the third one is something I don’t see very often. I find that one easier to understand and more fatal than the other two. Yeah MrX, don’t you love it when they know how much man-made CO2 is in the atmosphere. It is so properly labeled, just like the merchandise on the shelve–“Made in China”, “Made by Man-Kind”. Just read the label on the molecule…. Singer thinks that the measured warming is due to local effects (e.g. UHI?) and is not a true representation iof the world’s surface. I will stick my neck out and say No. The rate of warming in the first part of the 20th Century was the same as the second. To me this makes the idea that CO2 is the principle driver of warming – untenable. But the same goes for local effects. MORE than a million square miles of Arctic seas have frozen in the past year as a new environmental trend takes hold, dubbed “global cooling”. But Pat, The Guardian tells us that this is just regression to the mean. Both articles claimed that Arctic sea ice extent grew 60 percent in August 2013 as compared to August 2012. While this factoid is technically true, it’s also largely irrelevant. This is apparently due to the chance of rapid loss of ice in September and that the 60% growth is merely regression to the mean. I would ask whether, if a 60% increase year on year is an indicator of the natural annual variation, then is the effect of temperature that significant at all? But I am constantly getting my posts banned at the Guardian right now – so I left the echo chamber to disappear up it own posterior.. The audios are right here. If there was something in Chief Justice John Roberts past that Obama operatives could bribe him with, how has it not been leaked by now and how did it escape discovery during his appointment by George W. Bush and during Roberts’ conformation hearings? You guys appear to have become conspiracy woo woo theorists, wuwt? No, the country was lost on July 6, 1946. It just took a while to become realized.